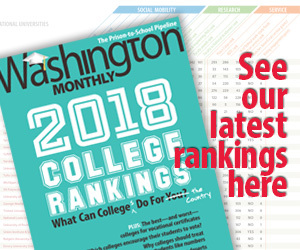 Washington Monthly | What’s More Important, Average Salaries or Average Debt? What’s More Important, Average Salaries or Average Debt? At the bachelor’s degree level, the highest earning graduates came from two career-oriented programs at the University of Richmond, where graduates in information sciences and in human resources management averaged more than $69,000 per year. Meanwhile, graduates from sixteen programs across the Commonwealth earned on average less than $24,000. Most of these are traditional liberal arts programs, such as Philosophy or fine arts related. Well right, of course it works that way. Should we be surprised? Something would be very wrong if philosophy majors earned more than people who majored in vocational things like human resource management. Although there are many rewards to postsecondary education besides the boost in wages, students who borrow too much in relation to their early-career wages may not have the opportunity to fully appreciate these other rewards. …We think the data we report should be made widely accessible to the public and be a central component of consumer choice. Duly noted, but the AIR report was released by the the State Council of Higher Education for Virginia (SCHEV), a Virginia organization that “makes higher education public policy recommendations to the state. If the point is to make higher education policy recommendations, however, it’s perhaps not best to get hung up on consumer choice, which is of sort of limited use here. As I’ve pointed out before, reports like these tend to suggest something sort of troublesome. If graduates with majors with engineering and math and biology tend to make more money and have an easier time paying off their debt, more people should major in these things (or make better-informed decisions about… what to major in”). This is ridiculous. We actually need people majoring in philosophy and English literature and women’s studies and anthropology. These subjects are important. People majoring in such subjects know, if they stick with that choice as an actual career, that they’ll make less money. That’s fine. People should be allowed, even encouraged, to have professional careers where they don’t make much money. Most people aren’t rich; that’s okay. The problem is the cost of the programs. If we’re talking about consumer choices, it’s perhaps worth asking why any Virginia offers any programs in which students could potentially not make enough money to pay of their debt.